Hello! I’m here with the only breakfast you’ll ever need. Or the only brunch. Pimento cheese grits. Add brunch to that title and it means you can have a glass of champagne, no judgement! This is why brunch exists. So we can drink in the morning without a care in the world. Sidenote: I was very inspired to do that with a mimosa on the airplane yesterday buuut I was with my kids. Okay, so I know. That might not make any sense. 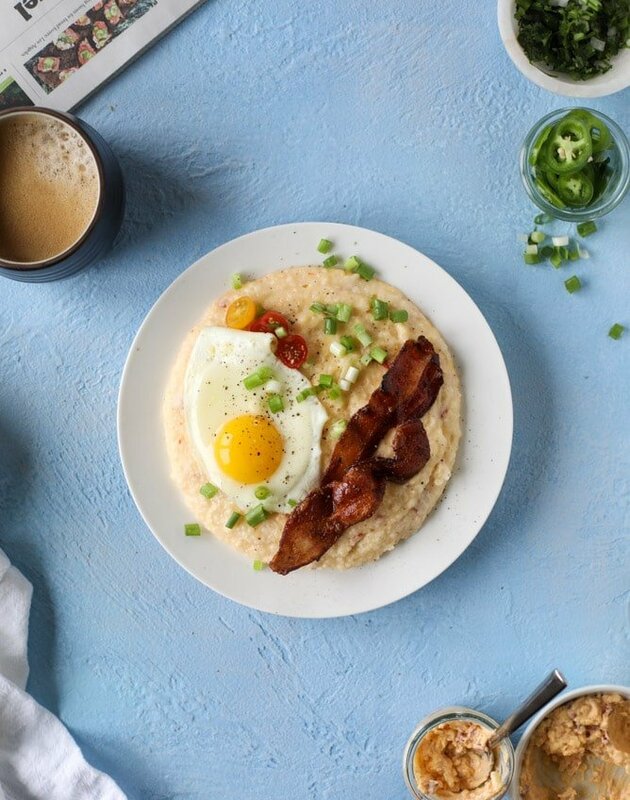 Sure, grits are for breakfast or brunch to begin with. But these ones. THESE ONES OMG. First, they have pimento cheese stirred in. Oh so delicious. Cheesy and amazing. But then, they are topped with a fried egg and crispy bacon. A sprinkle of scallions. A big extra scoop of pimento cheese. A drizzle of hot sauce if you’d like! The pimento cheese adds so much ridiculous flavor to these. If you have some extra left over from a party? That’s the best time for this dish. Of course, you can make the pimento cheese just FOR the grits. But it’s a great way to use up whatever is chilling in your fridge. If you’re going to make it for the Kentucky Derby, this should definitely by your Sunday brunch. And speaking of, tomorrow I am going to share a full line up of my favorite Kentucky Derby cocktails and treats! And there is even a derby menu in The Pretty Dish, if you have a copy. These are just a dream meal. So much texture. Ridiculous flavor. Major comfort food! But you could even serve it in tiny portions (maybe minus the egg) for an appetizer. And now I want to make this for dinner. 1 cup quick-cooking grits I like the quaker 5 minute grits, but you can definitely use the stone ground if you’re a grit purist! – just follow the directions they come with. Add all ingredients together in a large bowl and mix well until combined. You will have some leftovers, so store it in a sealed container in the fridge! Best dip ever with crackers and veggies, woohoo! As a note, I like to get the bacon started (I usually just fry it in a skillet!) and have a skillet or pot ready for your eggs. Bring the stock to a boil in a medium saucepan. Once boiling, add the grits and whisk constantly until they are fully mixed into the stock, about a minute or two. 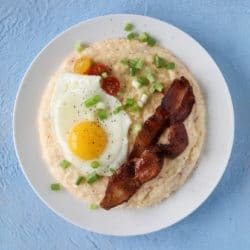 Reduce the heat to low and cover, stirring once or twice more, until the grits are thicker and creamy, about 5 minutes. Stir in about 1/2 to 2/3 cup of pimento cheese until creamy. Keep the grits over the lowest heat possible and take a few minutes to cook the eggs to your liking. To serve, spoon the grits into bowls. Top with an egg, a slice or 2 of bacon and some green onions. I like to serve with a spoonful of extra pimento cheese! I want to float on that little yolk raft in this pool of grits. YEP. Look at that! What a breakfast! Perfect for a great start! I don’t think I have ever had grits. What are they like? Heaven. They are like heaven. I agree, Carly, Heaven! Alicia, grits are ground corn. However, so many ways to prepare them and so many consistencies. You can be turned off or turned on by your first bowl. I’d certainly not want you to have a bad bowl as they are so creamy and such a delicious comfort food. My favorite way to prepare them is with milk, salt and cayenne pepper, then stir in butter till melted at the end of cooking time. I have had pimiento grits at Landry’s (New Orleans) and corn grits at Zea’s in Lafayette. Both were delicious! I like just plain grits, but these two take it to another level. I found the recipe for Zea’s under corn grits, and though I did not see Landry’s recipe, I will try this one and several others online. They are hat good!! !